This Burgol brush features yak hair bristles and a beechwood handle. Each sophisticated, premium brush is meticulously handcrafted — due to its special, fine structure, yak hair can’t be mechanically threaded through brush heads. Instead, specialist brush-makers assemble brushes out of this unique hair. Since these yak hair brushes are handmade, they cost over ten times as much as mechanically assembled brushes. However, these Burgol brushes are extremely long-lasting and, when carefully maintained, can also be passed down for generations. This yak hair brush is perfectly easy to use, since it is extremely lightweight and its 18 x 5 cm wooden handle is extremely handy for making the requisite polishing motions. Incidentally, although this yak hair brush has the same amount of bristle holes as a conventional goat hair brush, it is far denser, which makes it more effective at producing a perfect high shine. 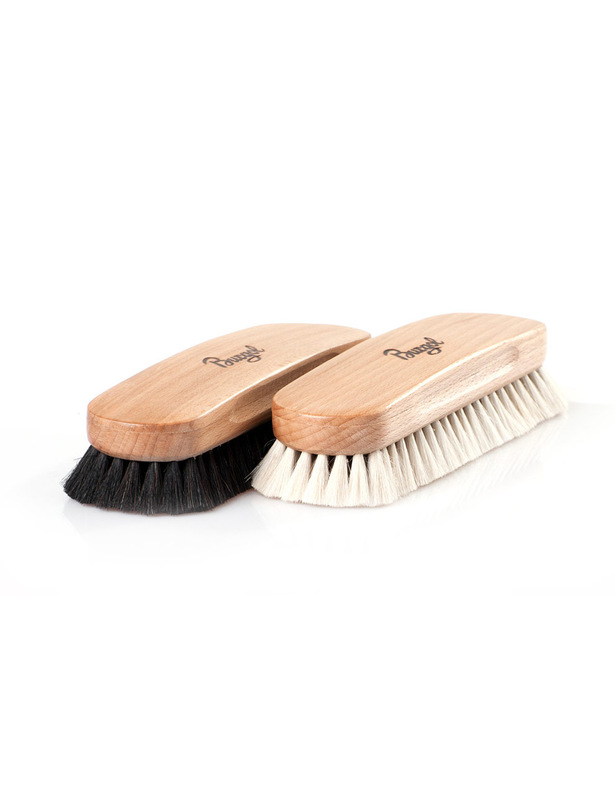 This premium polishing brush creates a gorgeous, glassy polish on shoe surfaces. The Burgol yak hair brush is available with light or dark bristles.